Below you can view all the homes for sale in the Pinnacle Shores subdivision located in Mooresville North Carolina. 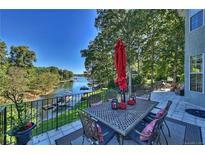 Listings in Pinnacle Shores are updated daily from data we receive from the Charlotte multiple listing service. To learn more about any of these homes or to receive custom notifications when a new property is listed for sale in Pinnacle Shores, give us a call at 704 604 8836. Centralvac, Irrigation, Rare Hardwood, Limestone, Walnut Decking, Fountain, Unique Lighting, Speakers, Close Waterfront Dining, Views In Almost Every Room, Community Amenities, Neutral Throughout. MLS#3487070. Lake Homes Realty LLC. Very desirable, open floor plan with master on main. Tranquil water views throughout. MLS#3465113. Nagy Properties. Extend your fun to the water with the covered dock in this quiet lake cove. MLS#3444343. Lead 2 Real Estate Group. Tall crawl w/concrete floor & double doors for equip storage & easy backyard access. MLS#3418011. Keller Williams Mooresville.